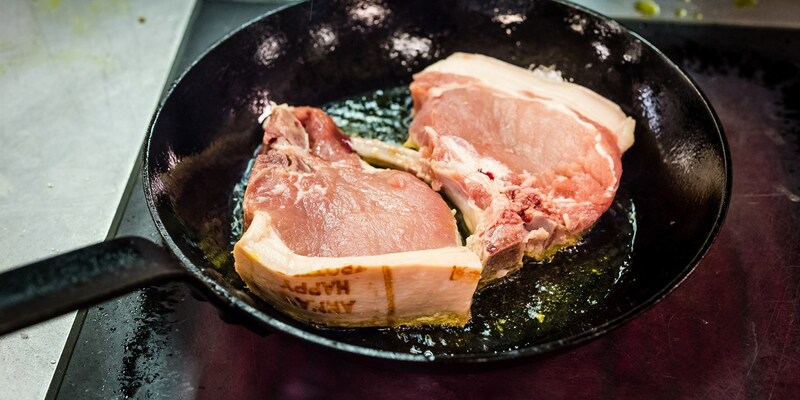 Pork chops come from the loin and are sliced perpendicular to the pig's spine. They can be sold both on and off the bone, but should always have a generous rind of fat to add richness and flavour to what is otherwise quite a lean piece of meat. They are best cooked quickly and over a high heat, making them a fantastic cut for the barbecue. This collection of pork chop recipes demonstrates the versatility and year long appeal of this tasty cut, with warming winter comforts and summer barbecue dishes alike. Matthew Tomkinson's Apple and pork chop recipe pairs the sweetness of pork with the sharp tang of apple, and Marcus Wareing similarly applies this classic combination in his Barbecued pork chop recipe with apple purée, endive and barbecue sauce. For a vibrant, colourful option for the summer try Robert Ortiz's Pork chop with prunes, red cabbage and Greek yoghurt, where the chops are first marinated for several hours in Peruvian achiote oil.